A common assessment about landscape painters is that they simply “catch” nature at its most vulnerable, during moments of staggering beauty in which the light, shadows, clouds, land formations, time of the year and time of the day, they all just click into place and create a scene of perfect harmony. While this certainly happens, that school of thought places the burden on nature itself. For P.A. Nisbet, some of the burden rests on the artist. Nature can unfold one majestic scene after another, each more incredible than the one before it, but if the artist isn’t prepared to receive it – technically as a painter with a brush and some paints, emotionally as a sensitive receptor within nature and existentially as an imperfect witness to that time and place – then those Grand Canyon views might as well be parking lots. If Nisbet paints his own life and his own experiences into his work, then much of his life will be on display in a new retrospective at the Eiteljorg Museum of the American Indians and Western Art in Indianapolis. 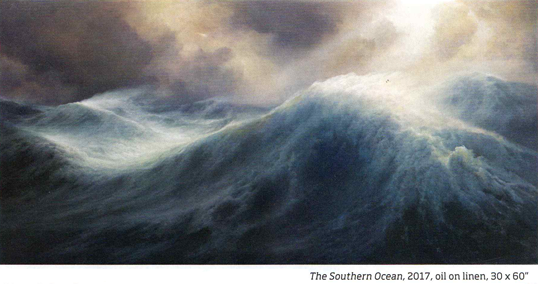 The exhibition will open in conjunction with the Quest for the West exhibition, which Nisbet is also participating in. It was during last year's Quest for the West that he was awarded the Artist of Distinction award, a coveted prize that comes with an exhibition at the following year's Quest show. The exhibition's title, Light, Space and Power: The Art of P.A. Nisbet, refers to three uniting themes within the artist's works. The exhibition will feature 23 works, some dating back to 1981, as well as a number of new pieces created for the retrospective. Nisbet, who lives and works in Santa Fe, New Mexico—his studio once belonged to Ashcan painter John Sloan—was not looking forward to revisiting his old work as preparations for the exhibition came together. “I’m too close to them and I don't like to do that kind of reflection back. It's a highly emotional thing because artists can be in isolation for long stretches of time over decades. Being an artist is a solitary experience, so to have, after all these years, these children of mine together again it really requires the deepest part of me to have a reflection on my experiences with them and with nature,” Nisbet says from his studio. “I’m just very critical of my own work because my process is so deliberate and they unveil things that I actually experienced in the wild. And they are all that remains of those experiences because the experiences themselves have vanished." 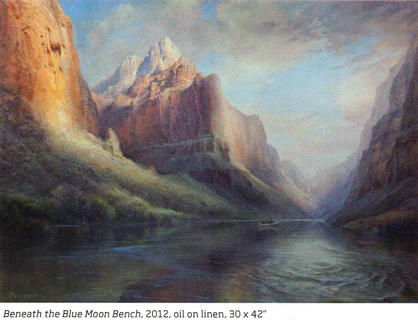 Although they preferred the American Southwest, both artists would roam around the country and even the globe. They often went to extremes, including in the mid—1990s when they both went to the South Pole on separate grants from the National Science Foundation, which put them up at McMurdo Station in Antarctica, the base of operations for the United States Antarctic Program. Nine days, and multiple forays into subzero weather, later they returned to warmer climates with a new outlook on the world. 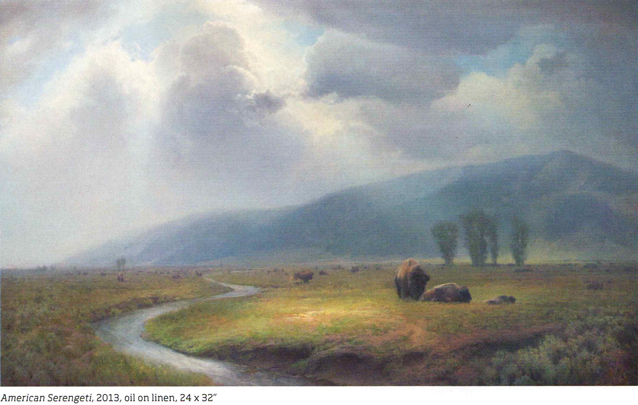 These days Nisbet is recognized as one of the leading Western landscape painters, whose works hearken back to the American luminists of the 19th century but also offer contemporary meditations on nature's unrelenting beauty, particularly in relation to the limitless horizon that mesmerized him so many years ago. 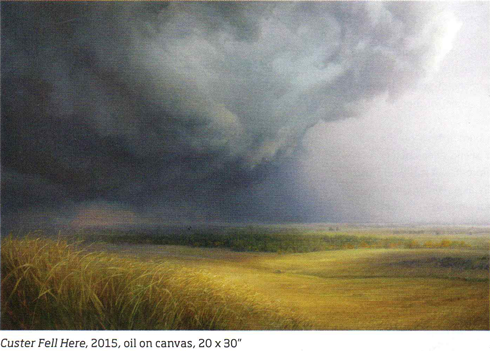 Works in the retrospective include Custer Fell Here, a somber look at the Little Bighorn battle site; The Wreck, a beach view with a magnificent wave crashing in an explosion of white spray; Composition for Cloud in Pewter, a more tonal take on a land— and cloudscape; Lava Falls, showing river rapids made more terrifying by Nisbet’s detailed and moody depiction; and three works that could easily be mistaken for major works by Thomas Moran: Beneath the Blue Moon Bench, Rough Country and Storm Break at Yaki Point.